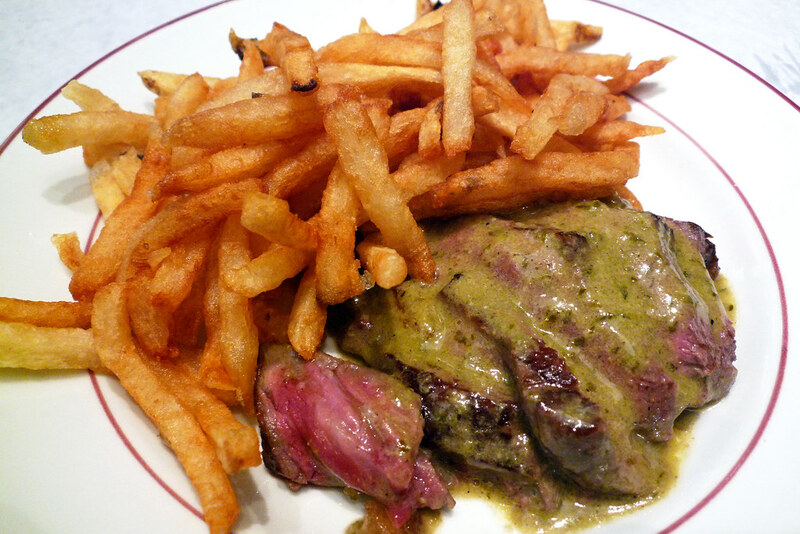 In this solo dining adventure, Gary has the prix fixe steak meal at Le Relais de Venise l’Entrecôte, partly because he loves steak but mainly because that’s the only option that exists there. In my time dining in New York City, I’ve pretty much seen every different menu option a restaurant has to offer – a la carte, prix fixe, and tasting menu. But until I dined at Le Relais de Venise l’Entrecôte, a domestic branch of a French chain, I’d never seen what they have to offer. A food menu with one – yes, one- option. When you dine here, you will have the salad, the steak, and the fries because that’s all there is to eat here, dessert notwithstanding. You’re a vegetarian? Tough. Can’t eat beef for religious reasons? Forget this place even exists. I’m perhaps being a bit rigid in my description – after all, you do get to choose how you want your steak done. But then again, it’s either rare, medium, or well. They don’t do that medium-rare or medium-well malarky here. Maybe that’s just something the French like to do? But when you only do one thing and one thing only, you better damn well make sure you do it right. Actually, you’d better hit it out of the frickin’ park if that’s all you do. 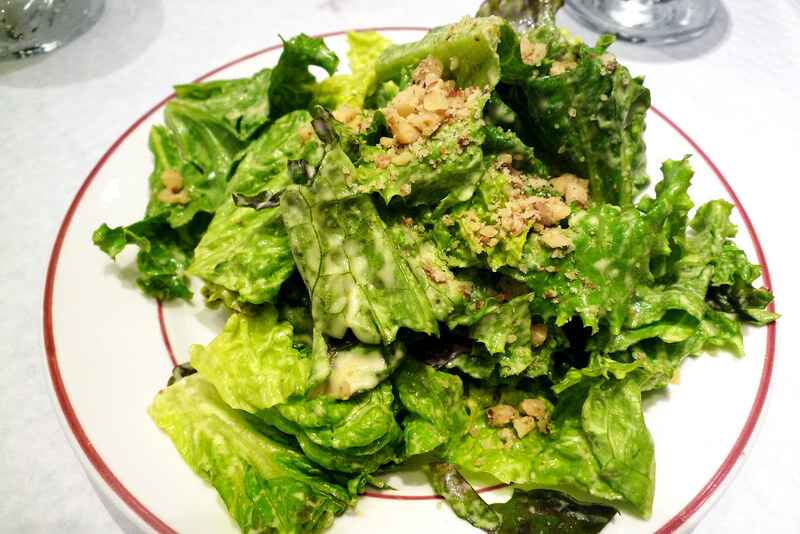 My meal – oh right, everyone’s meal – started with the green salad with mustard vinaigrette. It’s like any green salad you’ve ever had with a nice mix of different greens dominated mostly by lettuce and a vinaigrette that gets some good creamy texture from the mustard, then topped off with some chopped nuts. Nothing to write home about but it’s a good start to the meal. Then there’s the steak, a small cut of strip steak that’s then sliced thinly onto the plate before it’s drizzled in a rich, creamy, slightly peppery sauce. Cooked to rare which is something I prefer not to do but when not presented with the option of medium-rare, it would have to do, the steak is perfect. Each slice has a slightly brown ring on the outer edge before it’s unrepentantly red on the inside. The sauce is piping hot so it almost does the job at turning the steak into a medium-rare though it’s probably somewhere in between the two temperatures. The fries here are incredibly crispy but turn soggy quickly when they swim in the sauce. Not to say that there’s something wrong with that – there are worse things in the world than to eat potato products soaked in a fatty sauce – but it’s still sad to see these fantastically crunchy fries turn into mush. Oh, and just as you’re about to dive into that last slice or two of the steak, the server comes over with a tray of more steak. And it’s your steak! Incredibly enough, that first plate with its decent helping of steak, not to mention the fries, was just the first act in this production. More fries and sauce to go with the second helping of steak? Why, yes, I think I will have some more fries and sauce. 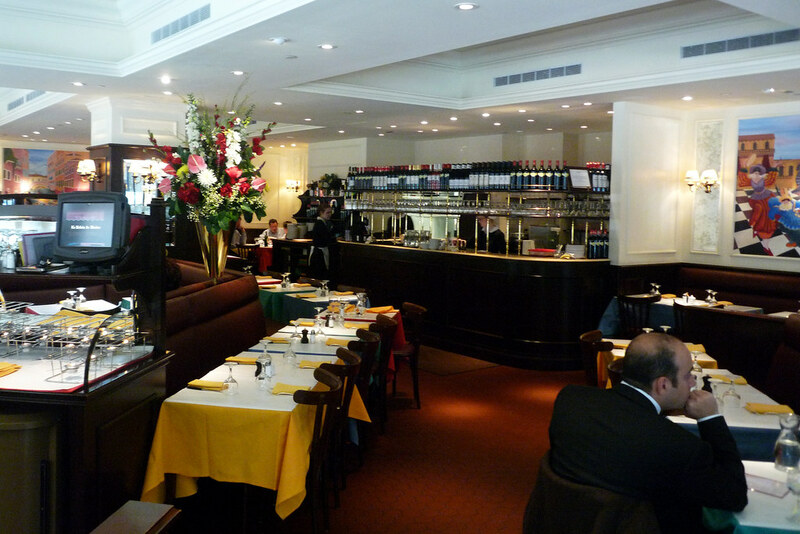 I’m admittedly not much of a steak fan, or rather a steakhouse fan, but I certainly took a liking to Le Relais de Venise l’Entrecôte. Maybe it’s just because I like my steak served to me by waitresses in cute French outfits. I am a dude, after all. But, really, it’s just a well-executed idea that manages to turn the limited menu into a plus rather than a detriment. More importantly, having the one menu means a general consistency which is something all restaurants should strive to meet at a minimum. It’s something that this restaurant has in spades if my two visits here are any indication. Le Relais de Venise l’Entrecôte. 590 Lexington Avenue, New York, NY 10022. [Show/Hide Map] (212) 758-3989.